I am going to redesign my workspace that i use, but only because i am moving it to another room in my home. The one it is in is just to small now for me and my sd. I have been searching for quite sometime with limited success finding ideas to make my experience more enjoyable. My question for other disabled people on here is: What kind of set up do you have that allows for you to work from a sitting position(i dont use a wheel chair yet, but that is likely coming as well). I do mostly small projects that involve planing, sawing, shooting board, glue up .. the usual i guess. Trying to keep EVERYTHING in arms length seems impossible at times and this limits what i can do at the time. Any advice from others doing this would be appreciated. Also a number of articles appear when a Google search is done using the search phrase “wood shop for wheelchairs”. Perhaps one or more of these articles could augment info found in Woodcraft Magazine. I have the same issue. I can walk some but not a lot. Step 1) put down floor pads. Get a small light chair that you can hook with a toe to pull in or to kick out of the way. Put everything but the TS on wheels. 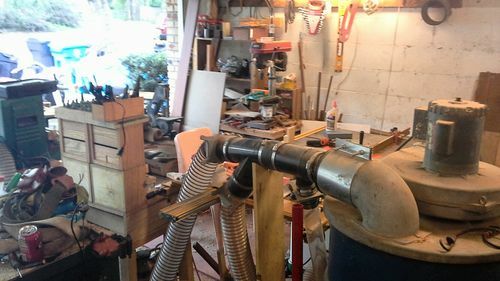 Here’s my shop, 8’ x 12’ = 96 sq ft. 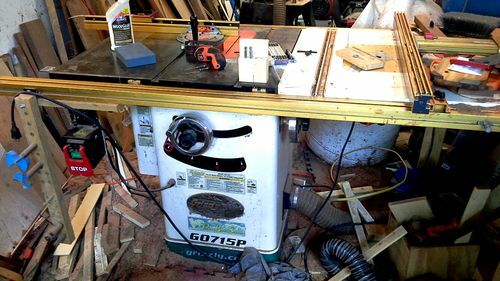 I use top of the TS as my workbench. I build kitchen cabs in that space.